One of my absolute favorite things I love about blogging is receiving email from my readers. The mail I receive is either in regards to a recipe I posted, a general request for help or advice about something dessert related, or just someone who feels compelled to say hello. But yesterday I received a very different email, one from a very sweet woman named Angela. Angela wrote to me about her dear friend Rhonda, who is battling a very aggressive form of leukemia. Unfortunately, Rhonda is has been suffering from horrible sores in her mouth and throat due to the rigorous chemotherapy she's been undergoing and Angela needs help finding tried and true recipes to make for her that are soft and easy to swallow. 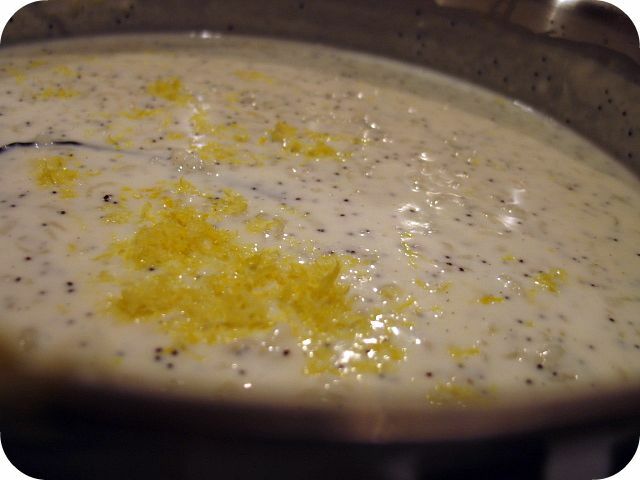 The first recipe I thought of was this lemon poppy-seed rice pudding that I had originally posted almost two years ago. It's a bit more sophisticated than the standard cafeteria issue rice pudding most typically think of. This pudding is very special in that it uses Aborio rice, which the same rice that is used to make creamy risottos. It cooks slowly in a bath of whole milk and coconut milk which marries perfectly with the delicate flavor of a whole vanilla bean and the mellow, richness that comes from slowly simmering lemon zest. The poppy-seed adds texture and a slight smoky, nutty flavor and well as visual appeal which according to Angela is one of Rhonda's favorite things about good food. The desire to have small but precious comforts at a time of extreme physical distress is something to which we can all relate. I find this such a sweet gesture, and my heart is warmed and honored by a chance to help make life just that much better for Rhonda. In a large, heavy pot, combine milk, rice, coconut milk. Mix well and let sit for 30 minutes. Add vanilla bean (entire bean and scraped seeds) and poppy seeds. Mix well and bring to a simmer over a moderately high heat. When it starts to bubble, reduce heat to low and simmer, stirring often, until the rice is tender (approximately 50-75 minutes). Add the sugar, cream, and lemon zest and continue to simmer for another 10 minutes. Let cool to room temperature and cover with plastic wrap. Store in the refrigerator for at least 2 hours. Serve alone or in a wide brimmed glass layered with freshly whipped cream. * I strongly encourage you to buy a new container of poppy-seeds. If the poppy-seeds are too old, their staleness will be amplified in this dish. Moreover, you can get poppy-seeds in the bulk section of most grocery stores for next to nothing. I think the last time I bought them they only cost about .15 cents for a little more than 3 tablespoons. I think pudding was a great choice. What a wonderful gesture on both your and Angela's part. The pudding looks delicious, and I think you're so right. It is the small sweet gestures that can help in trying times. Here's hoping this pudding gives Rhonda a bit of needed sweetness in this tough time. Julia everytime I come to read your blog I find that you are once again doing something so sweet and thoughtful for someone else. You are without a doubt the most giving person I've had the pleasure knowing. While I don't have a recipe to pass along I would say flan is a good dessert. Creamy and smooth, it can easily be adapted to suit ones taste. ALso, my fave, ice cream though I don't know if she would be able to tolerate the coldness of it. 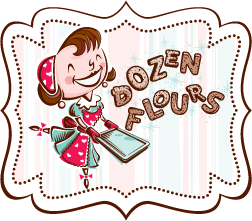 Best wishes to Angela on finding yummy recipes for her dear friend Rhonda who I hope will be able to enjoy them! The lemon poppy seed combo as a rice pudding sounds really good. You are so sweet to do this, how about a nice cheesey soup like Wisconisn Cheddar Soup, she would beable to eat it and get some protein too. Maybe homemade applesauce or a nice fresh fruit smoothie. I love your rice pudding! ohhh. that sounds so delicious! i've never thought of taking the lemon poppy seed flavors out of the muffin tin - but this looks so, so good! What a lovely recipe. You are such a kind soul, always making someone else's day special. I'd suggest any pureed soup. I made a nice curried cauliflower soup recently and a wonderful pineapple ricotta pie. For the pie, I would suggest baking it in a ramekin and leaving off the crust (both ways are mentioned in my post). It can be made with or without the crushed pineapple as well. And I'm with Ingrid on the flan, which I also posted very recently. Your desserts look great. I can't wait to try some of your recipes. Thanks for sharing them.